Bladed jigs catch huge numbers of fish, so we wanted to create this blog post to show you How to Make a Chatterbait Style Bladed Jig in a few very easy steps. Some people like to pour their own lead jig heads and then paint them before assembling everything to get the finished product. 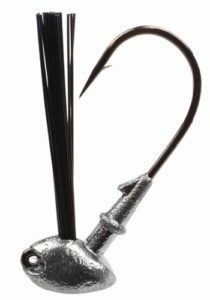 This gives them 100% flexibility when it comes to the style of the jig head, the color of the paint and the style of eyes they choose to use, if any. Some people simply prefer to buy the finished parts and assemble the lure without the hassle of pouring, painting, etc. This makes it super easy because all you need to do is grab all of the parts you need and simply put together the combination of parts that will create the exact lure you need for the lakes and rives where you fish. This way also requires much less effort, since there’s no need to pour lead or paint the heads prior to using them. All it really takes at this point is to decide what size and color you want your bladed jig to be and then grab the necessary parts to make that happen. In short, you will need a jig head, a blade, a split ring, a wire snap, and a skirt. That’s it. Once you know How to Make a Chatterbait Style Bladed Jig, those few parts are all you need. There are a couple other optional items that we will discuss a bit later, but they aren’t necessities. 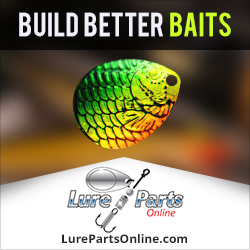 Once you’ve gathered your parts, here’s what you’ll need to do to create the actual lure. First, you will need to attach a split ring to the blade, using a pair of high quality split ring pliers. The next step will be to attach the split ring to the eye of the jig head. If the blade is bare, with no sticker on it, it doesn’t matter which side faces forward or backward. But if you do have a sticker applied, you will need to make sure the a sticker is facing forward before attaching the blade to the jig head. If you choose to leave the sticker off until the blade is attached to the jig head, you can simply apply the sticker later. This makes it easier because you can attach the blade without having to worry about this part of it. The next step is to attach the snap to the blade. You will need to open the snap and then slide the open end down into the top hole on the front of the blade. Slide it all the way in until it moves somewhat freely (see the video below for an explanation of this). Next, you will need to push the open end into the bottom hole on the back of the blade, and then move it slightly in order to get it to push back out through the front of the blade. Now you can simply close the snap and double check to make sure it’s firmly closed. At this point, you’ve assembled the actual jig itself. The only thing left is to slide the skirt on. Once the skirt has been added you have a completely finished lure. Earlier in the article, I mentioned a couple of different options that I would discuss later. So let’s talk about those. First, with the blades there are a few different options. 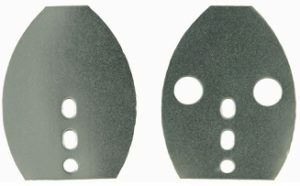 The finish of the blades can vary from bare stainless steel, to a few different types of plating. These blades are available with gold plate, silver plate, black nickel and a copper finish. 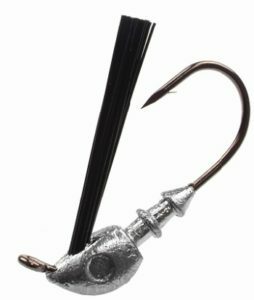 The various plating options allow you to create a bladed jig with a blade that’s tailored to the conditions you’ll be fishing, such as stained water, muddy water, clear water, etc. Or it can help to better imitate certain baitfish based on their color. 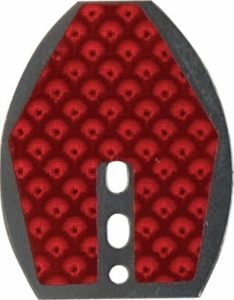 Another blade option is whether you want the blade to have “bubble holes” or not. Bubble blades are pre-drilled with extra holes that, in theory, leave a bubble trail in the water as the lure is retrieved. Lastly, for blade options, prismatic stickers are available in a wide variety of colors that will allow you to further customize the finished jig to whatever conditions you’ll be fishing it under. These stickers can be applied before attaching the blade to the jig head, or afterward. It’s all a personal preference. Most people choose to add a trailer of some type, to give the lure more action and more bulk. Trailers are available in a huge variety of styles, colors, shapes and sizes. You can choose the style that is best suited to your body of water and your own fishing style. The video below talks about trailers, and which ones work best under various conditions. If you’d like to learn how to tie a silicone finesse jig, click here. Special thanks to Curt Snow Fishing for creating this great video. This entry was posted in Making Your Own Jigs on May 21, 2018 by Lure Parts Online. Are you looking to learn how to make a brush jig? You’ve come to the right place! Jigs have been used to catch big bass for decades. They’re a proven fish catcher and are fun to use once you learn their subtle nuances. Brush jigs aren’t made to fish only in and around brush, despite their name. They can be used just about anywhere a bass will hide, including rocks, weeds, docks and more. 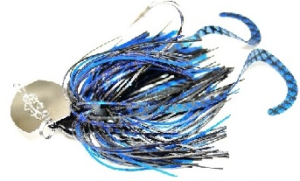 As with most other bass jigs, brush jigs can be dressed with a variety of materials. The most popular of those materials is rubber or silicone. Some people choose to pour their own brush jigs, using melted lead and a mold, such as the Do-It Molds BSH-3-SA Brush Jig mold. The SA model has 3 cavities and lets you pour jigs in 1/4, 3/8 and 1/2 oz. sizes. If you prefer heavier jigs, in the 5/8 oz. to 1 oz. sizes, you can use the BSH-3-SLA mold. This mold also has 3 cavities. Before you get started, you’ll need to gather up some materials and parts to make your jigs with. You’ll need lead, fiber weed guards and hooks for the jig itself. As always, be sure to do everything safely! Wear gloves to prevent burns to your hands. Or, at the very least, use latex or similar gloves to keep the lead residue off your hands. Some people also like to wear a mask to prevent breathing in anything toxic while pouring the lead. Again, some choose not to wear a mask, but to simply make sure they are in a well ventilated area, as mentioned in the video below. The video below will walk you through the rest of the process, including some great tips for prepping the mold and keeping the operation flowing without any problems. This entry was posted in Making Your Own Jigs and tagged how to make a bass jig, how to make a brush jig, how to pour jigs, how to pour lead jigs on March 2, 2018 by Lure Parts Online. If you fish with swimbaits, you should learn how to make soft plastic swimbaits yourself. As with making any kind of lure yourself, if you learn how to make your own soft plastic swimbaits, it will save you money and give you the opportunity to make baits that are exactly what you want. You will no longer be limited to what’s available from retailers. Additionally, you will be able to custom create colors that you can’t buy. This comes in handy when you want to “match the hatch” on a specific lake and, and duplicate the look of a certain type of baitfish. Many times this will trigger bites that you would not otherwise be able to get. For today, we’re going to focus on how to make soft plastic swimbaits, so let’s get back to that topic! The video below is a great tutorial, showing just about everything you’ll need to know to make these baits successfully. The video creator is using the 3.5 inch Ripper swimbait mold, which is part of the Do-It Essentials Mold series. This is a great mold. It’s high quality, and it just plain works! When you click that link above, scroll down to find the 3.5 inch Ripper swimbait (Model 014). It’s an awesome swimbait that flat out catches fish. Unlike the mold used by the video creator, the mold we linked to above is a 3-cavity mold, which will speed things up considerably when it comes to pouring larger numbers of swimbaits in a short time. Also, below the video we have listed all of the items you’ll need to pour your own soft plastics, including some of the basic equipment and safety equipment as well. As with anything, be sure to wear the necessary safety gear, to prevent getting burned or breathing in large amounts of fumes when pouring soft plastic baits. Safety always comes first! So, now that we’ve got all of that out of the way, give the video below a watch and be sure to take note for later. We promise that you will want to do this after watching! If you’d like to learn how to tie your own bucktail jigs, click here. This entry was posted in Making Soft Plastic Lures and tagged how to make soft plastic swimbaits, making soft plastic lures, pouring soft plastic lures, pouring soft plastic swimbaits on January 5, 2018 by Lure Parts Online. Learning how to tie a silicone finesse jig can be a bit tricky if you’re new to this method of tying. It’s not necessarily difficult to do. But there are a few little tips and tricks that can make it much easier to do, especially for the neophyte. Our video below will show you all of the steps involved. And by the time you’re finished watching, you’ll know how to tie a silicone finesse jig with no problems at all. You may not be a pro, necessarily, but you’ll be well on your way to doing it easily. Tying your own jigs will give you the benefit of being able to create them exactly the way you want them to look. So you ‘re not limited to the selection available from a retail store. Finesse jigs excel for bass when the conditions are tough, especially after a cold front or when the water is extremely cold. The smaller profile will be more likely to get bit when bulkier lures get ignored. Keep this in mind when you’re fishing under tough conditions. We have listed everything you need at the end of this post, but just to give you a heads up, you’ll be needing a fly tying vice, a small bass jig, some silicone skirt tabs and some fly tying thread. Smalljaw, the creator of the tutorial video, goes into some good detail with what he likes to use for skirt material, thread and glue. And since he’s been at this for quite a while, we can take his advice as being solid, not just theory. Tying the jig in the video requires only two colors, so you won’t need a huge selection of silicone skirt tabs. But choose your colors carefully. The idea with a finesses jig is usually to create something very natural looking. But don’t be afraid to experiment a bit. Sometimes a specific lake will call for an odd color combination that most people wouldn’t even think of using. And if you can find that color combination, you will catch fish that most people will miss out on. Check out the video tutorial below and then get yourself busy tying some custom silicone finesse jigs. The next time the bite gets tough, you’ll be glad you did! If you’d like to learn how to make spinnerbaits for bass, click here. This entry was posted in Making Your Own Jigs and tagged How to make a finesse jig, how to tie a finesse jig, How to tie a finesses jig for bass, How to tie a jig with a silicone skirt, how to tie a silicone finesse jig on November 13, 2017 by Lure Parts Online.